This healthful, tasty beverage also is beginning to be used by many spas in a variety of different ways, from desserts to sauces and everything in between. At Maroma Resort and Spa in Riviera Maya, Mexico, Oven-roasted Peaches, Cold Green Tea Broth and Spices are served as a main course, as is the Green Tea Poached Salmon offered at The Inn at Perry Cabin in St. Michaels, Maryland. Sundara Inn & Spa in Wisconsin Dells, Wisconsin, features green tea noodles along with steamed veggies and herbs in its Harvest Roll wraps, and for a decadent dessert, check out the Signature Green Tea Ice Cream from Chef Patrick Meany at Stevenswood Spa Resort in Littleriver, California. 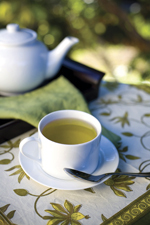 Green tea’s polyphenols are catechins, which are antioxidants by nature. One of the main catechins in green tea appears to be an effective agent against skin inflammation and cancerous skin changes,1 and these benefits have not been ignored by the spa industry. At The Eurasia Spa in Scottsdale, Arizona, The Ritual of Japanese Soaking features a relaxing tub treatment using green tea and milk to restore moisture to the body and balance to the soul. The Custom Green Tea Fitness Facial at The Spa at PGA National Resort in Palm Beach Gardens, Florida, features a green tea peel for silky smooth skin; and at Skindulgence, The Urban Retreat, in Port Moody, British Columbia, Canada, the Body Bliss service includes a green tea salt scrub for a renewing experience. The White and Green Tea Facial at The Lodge at Woodloch in Hawley, Pennsylvania, features essential oils and an antioxidant infusion for mature skin; and the Spring Inspiration Mandara Journey from the Four Seasons Hotel Bangkok in Thailand, includes a green tea scrub, splash and bath to induce deep relaxation. Also, at Lake Ozark, Missouri’s Spa Shiki, the full-day Shiki Bliss experience kicks off with a Green Tea Facial; and Houston’s ZaSpa’s Serendipity Ritual includes an indulgent green tea body wrap as well as green tea to sip. In skin care lines, the inclusion of green tea can illicit a variety of responses, ranging from anti-inflammation to aromatherapeutic benefits. Naturopathica’s Green Tea Wasabi Mask delivers softer skin devoid of irritation and free-radical damage, while Carol Priest Natural Cosmetics’ Intense Green Tea & Vitamin E Facial Day Balm hydrates, soothes and protects skin from free radicals. Give your clients a healthy treat with Bissinger’s Green Tea Gummy Pandas, which are a yummy way to provide antioxidants; and Chellá Professional Skin Care’s Chell-x Complex, a component in its skin care products, combines green tea, grape seed extracts and pomegranate to protect and defend the skin. Whether sipping, savoring or indulging in green tea’s benefits, your clients can enjoy this polyphenol dynamo in your spa in a variety of ways. Ancient, yet revolutionary, it may take decades to identify every body benefit this leaf can provide, but don’t wait that long to consider including it on your skin care and cuisine menus. 1. Pour very hot water into dry tea powder in an appropriate bowl and set aside in the refrigerator to chill. 2. Fire the cream with milk in a large saucepan over low heat until small bubbles form around the edge of the pan. Do not allow cream to come to a boil. 3. Remove from heat and gently stir in the sugar to dissolve. 5. Gently mix the green tea mixture and the cream/sugar mixture, and chill in the refrigerator overnight. 6. Freeze in one or two batches in an ice cream machine, according to the manufacturer’s instructions. 7. When finished, the ice cream will be soft and ready to eat.